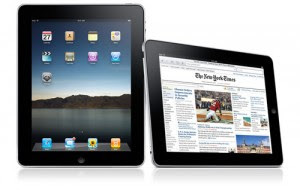 Today, Apple’s CEO Steve Jobs took to the stage to introduce a new device named the Apple iPad. Jobs began by revealing that Apple has reached 250 million iPod sales to date. He then revealed that “Apple is the largest mobile devices business in the world today.” Moving on throughout Jobs speech he questioned whether there is room for a third category device in-between a laptop or a smart-phone. Jobs then mocked competitors for investing in netbooks and immediately revealed the iPad. Jobs went on to demonstrate several features including browsing, Photos and built-in slideshows. The iTunes store is also built in and the usual suspects of a mail, contacts and calendar applications are available. Jobs also demonstrated the maps application and its location features. Various applications were demonstrated on the new iPad, some run at full resolution with slight pixelation whilst others run at their native resolution which seems far from ideal. A New York Times application was also demonstrated briefly that syncs between the iPhone app and includes in-line video clips. International data plans will be revealed in June. Apple also announced a case and keyboard dock accessory for “when you really need to do a lot of typing” said Jobs. News of the announcement saw Apple’s (AAPL) stock drop over 1% initially and later recovered and rose 1%.